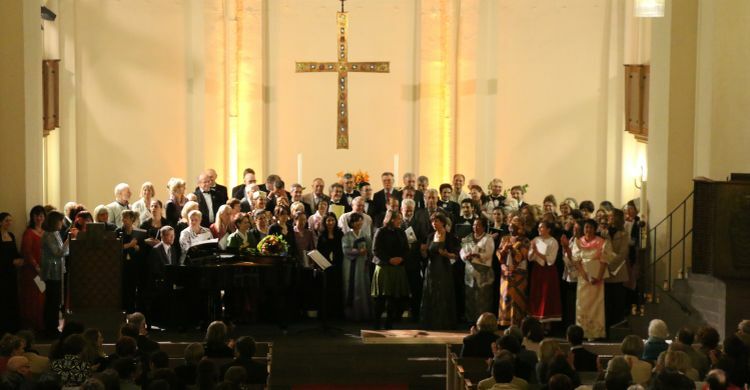 Bonn, 13 May 2014 – for the second year running, the Secretariats of CMS and AEWA jointly organized a benefit concert in Bonn, Germany as their contribution to the global celebration of World Migratory Bird Day. This year’s concert aimed to raise funds for the White-winged Flufftail, a Critically Endangered bird species, which is thought to have a population of less than 250 individuals remaining in the wild. The Operatic Choir Lirica San Rocco came all the way from Bologna, and was joined by the multinational choir of Deutsche Welle, the German international broadcaster. After the concert had been opened by CMS Executive Secretary Bradnee Chambers, the Lord Mayor of Bonn, Jürgen Nimptsch made a resounding call for donations to the audience to take the unique chance to save the White-winged Flufftail. Bird songs were in the air, when the Deutsche Welle Choir entered the church singing with many wearing their traditional costumes. The opening song “The Nightingale” by Felix Mendelssohn-Bartholdy and a selection of traditional songs which followed from countries such as Latvia, Korea and South Africa highlighted birds as a phenomenon linking nations and people across the globe. The intriguing rhythms of Deutsche Welle Choir carried the audience right into the heart of Africa. People started moving along with the sounds. Both choirs united for the final performance of “Va, pensiero” by Giuseppe Verdi. The famous choirs of the prisoners once again evoked the symbol of the freedom of migratory birds flying beyond borders. An enthusiastic audience of over two hundred music-lovers gave the performance a deserved standing ovation. The Lord Mayor, who had earlier hosted a reception for the two choirs at the city’s historic Old Town Hall, joined the choirs on stage for the final two songs. Proceeds from the benefit concert will be used towards a project aiming to conserve the White-winged Flufftail (Sarothrura ayresi), for which a joint CMS + AEWA action plan has been developed. In line with the action plan, the objective of the funded project is to identify new breeding sites and preserve habitats to ensure the survival of the species.